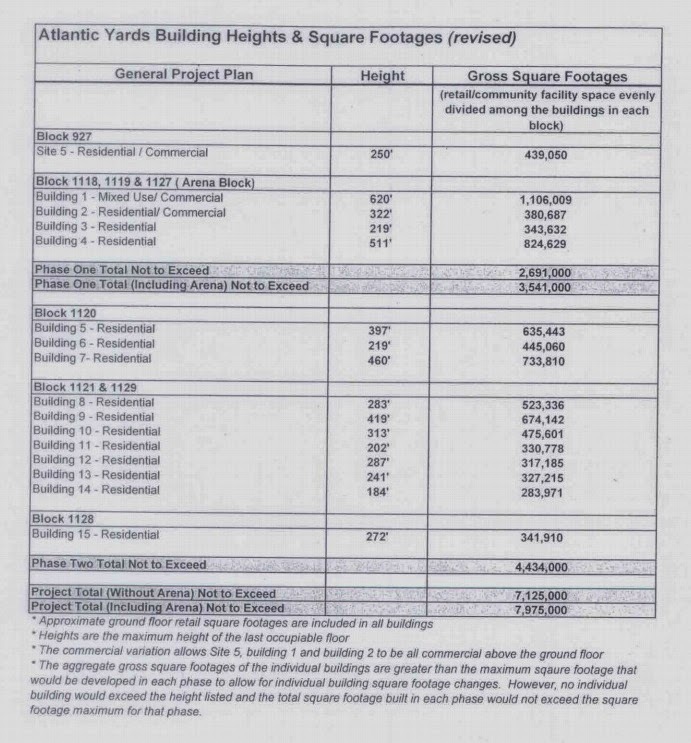 The latest Atlantic Yards/Pacific Park Brooklyn Construction Update was sent at 5:11 pm yesterday, after the second business day of ten concluded, by Empire State Development after preparation by Greenland Forest City partners, covers the two weeks beginning Sept. 28 and Oct. 5, though the document (see bottom), oddly enough, says October 11. Among the notable changes are the disassembly of the Atlantic Avenue crane for the arena green roof on Saturday, Oct. 10 (though that will not reopen traffic lanes); foundation work for the B3 site (Dean Street and Sixth Avenue), and the transfer of a mobile crane to the B3 site from the B14 site, at Carlton Avenue and Dean. See update below that confirms that Forest City is paying off an additional $11.6 million to NYC HDC. In an unusual occurrence surely prompted in part by delays and construction problems, developer Forest City Ratner next week will pay off $45 million in tax-exempt financing for the B2 modular tower rather than enjoying the fruits of the low-interest loan until 2046. Nor does the New York City Housing Development Corporation (NYC HDC) plan to issue the additional $45 million in tax-exempt financing once planned for the tower, also known as 461 Dean Street. That $90 million total would have gone halfway to paying for a tower initially slated to cost $183 million (including $117 million for construction). WPIX, which has a studio in the Barclays Center, is still practicing synergy, offering a sweepstakes for Premiere Week, when the New York Islanders season begins. As the Brooklyn Nets begin their fourth season in Brooklyn, there's some news, as noted by the Brooklyn Game not so grammatically, The Nets finally have a player that lives in Brooklyn. "It's a good environment," Young said. "We like to come down and walk on the piers and walk on the bridges and stuff like that. Plus, the practice facility is gonna be in Industrial City [in February] so that's gonna be probably 10-15 minutes away from here, and like I said, Barclays Center is right up the street. That suggests the location is in the Downtown Brooklyn area. Update, it's sort-of Brooklyn Heights, actually a large condo building in a former factory. What a difference (nearly) 12 years makes. When Atlantic Yards was announced in December 2003, the project was to include 4500 rental apartments, half of them below market, and 2 million square feet of office space. Jobs, housing, and hoops. By 2005, thousands of condos had been swapped for office space, and ultimately 1,930 condos were approved, for a project renamed last year Pacific Park. The Calendar for Brooklyn Community Board 6 notes that, on Monday, Sept. 28, the Environmental Protection Permits & Licenses Committee will review numerous applications, include "a new on-premises liquor license application submitted to the State Liquor Authority" on behalf of the Barclays Center. According to the application, which CB 6 shared with me, the arena food and beverage operator, Levy Premium Foodservice, aims to add one new point of sale to the current total of 57. The location will be on the main concourse, at entry level, as shown in the graphic below, with be full liquor service. Given the relatively modest change requested, I wouldn't expect it to provoke much pushback. The meeting is at 6:30 pm at the auditorium of John Jay Educational Campus, 237 7th Avenue, between 4th & 5th Streets. There's not much new in the THE BARCLAYS CENTER SHAKEUP: JAY Z’S OUT, CHINA’S IN AND ATLANTIC YARDS LIVES ON, from the real estate publication Bisnow, published 9/24/15. And there's a good deal ignored, such as the actual affordability of the planned subsidized housing, the continuing temporary certificate of occupancy, and the reasons for the arena's new green roof. But there are a few interesting observations--and mistakes--as well as some clues to how business-friendly publications may frame the project. The only person quoted is Forest City Ratner CEO MaryAnne Gilmartin--where's new majority owner Greenland?--who calls Barclays Center "a place-making juggernaut," citing 5.5 million visitors. Basically, I argue that, after the parent company Barclays PLC pleaded guilty to a felony regarding rigging the foreign exchange market, its affiliate, Barclays Services Corporation, qualifies as a "Prohibited Person" and thus should not be able to contract with the arena operator. Here are screenshots from some backing documents for the essay. How is Barclays Services Corporation connected to Barclays PLC? Barclays Services Corporation is wholly owned by Barclays Group US, which is wholly owned by Barclays Bank PLC, which is wholly owned by Barclays PLC. I'll write elsewhere about the book as a whole--it's a great conceit, but mixed in execution--but here want to address the significant sloppiness regarding Atlantic Yards. Atlantic Yards gets a few mentions, but the main passage is below right, from Chapter Six. It could have used some fact-checking. Some of these errors may be small, but it shows how easy it is to get wrong, fueling future errors from those relying on this source. The Barclays recent released updated event calendars for the next few months, which make some tweaks from the previously issued ones, published here. The masonry concrete building, slated to rise 26 stores and 272 feet, will include 323 units in 273,930 square feet of residential space (that's an average of 848 sf/unit). As noted by The Real Deal, there would be eight apartments on the sixth floor, 16 units on the seventh floor, 17 apartments on each of the eighth through 10th floors, 18 units on each of the 11th through 16th floors and 14 units on each of the 17th through 26th floors. The lot area is 21,155, with 80% lot coverage and no outside open space. Not one but two pages in this past Sunday's New York Times Magazine were devoted, at least in part, to the 550 Vanderbilt condo tower at the southeast end of Atlantic Yards/Pacific Park. Both show that deceptive rendering that s-t-r-e-t-c-h-e-s the three story brick building at left and tilts the substantial 202-foot tower into the distance, diminishing its bulk. 550 Vanderbilt, designed by the celebrated architect COOKFOX, brings 278 exceptional residents to the heart of Pacific Park, Brooklyn's newest neighborhood. One, Two, and Three Bedroom Condominium Residents from $830,000 Um, it's not a neighborhood. Note that one-bedroom units are said to start at $830,000. According to the building's page on StreetEasy, one past listing for a one-bedroom was $800,000, but the current least expensive one-bedroom is $815,000. As its three-year anniversary approaches at the end of September, the Barclays Center remains on a Temporary Certificate of Occupancy (TCO), apparently its 16th, according to Department of Buildings (DOB) records. See document at bottom, which is dated 7/25/15 and lasts 90 days before it must be renewed. As I wrote in October 2013, an extended TCO is nothing new for sports facilities. Yankee Stadium got its Final Certificate of Occupancy in March 2012, after nearly three years, which is faster than Barclays, but Citi Field, which also opened in the spring of 2009, got its document in July 2013, more than four years later. What is arena waiting for? The Barclays Center TCO states, "There are 26 outstanding requirements. Please refer to BISWeb for further detail." Forest City Enterprises has filed with the Securities and Exchange Commission a proxy statement sent to shareholders regarding the 10/20/15 vote to reorganize the Ohio-based corporation into a Maryland corporation that will qualify as a real estate investment trust (REIT). By reorganizing, Forest City Realty Trust will not be subject to federal corporate income taxes on distributions. As a REIT, Forest City must distribute annually at least 90% of its REIT taxable income, which will exclude any taxable real estate investment trust subsidiary (TRS) unless that TRS pays dividends to the REIT. It's the visuals that count. The large photo below accompanies a New York Times Sports section piece today, Islanders Embrace Their Future in Brooklyn While Staying Connected With the Past. See Brooklyn Borough President Eric Adams, NHL Commissioner Gary Bettman, WFAN's Craig Carton, Barclays Center developer Bruce Ratner, and arena/Nets CEO Brett Yormark all posing with new alternate, black-and-white jerseys for the New York Islanders. It's would look perfect in a press release. Hey, where are the Islanders' owners? Do note that New York City Bill de Blasio did model a jersey, too, as pictured above right. Bettman cited history as he touted Barclays Center, where the Islanders will host the Stanley Cup champion Chicago Blackhawks in the season opener on Oct. 9. A notice from Pacific Park Brooklyn: Community Notice On Saturday, September 19 & Sunday, September 20 from 6AM to 9PM as part of the construction of the Pacific Park development, a crane is being assembled within the construction site on Pacific Street between Vanderbilt Avenue and Carlton Avenue. At the periodic Community Update meeting Wednesday night, Greenland Forest City Partners unveiled the design for the B-12 tower, 615 Dean Street, one building in from the 550 Vanderbilt tower at the southeast corner of the site, which is Vanderbilt Avenue and Dean Street. By contrast, the 550 Vanderbilt condo tower maxes at 202 feet and 330,778 square feet, and the 535 Carlton affordable rental tower, at the corner of Carlton Avenue and Dean Street, maxes at 184 feet and 283,971 sf.